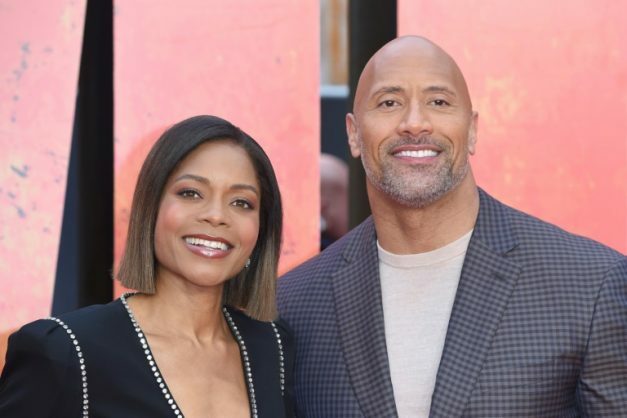 Sci-fi action flick “Rampage” topped North American box offices over the weekend, taking in an estimated $34.5 million to barely beat out horror film “A Quiet Place,” industry tracker Exhibitor Relations said Sunday. “Rampage” stars hard-working Dwayne (The Rock) Johnson in a plot perhaps better seen than described: He plays a primatologist who befriends an albino gorilla who grows to enormous size after a rogue experiment and who then teams with Johnson to stop invading monsters. While the three-day take for the new Warner Bros. film was said to be one of the best ever for a video game spinoff, its $120 million budget means the movie “will need to have strong legs to make its money back,” Hollywood Reporter said. Naomie Harris co-stars. “A Quiet Place,” in its second week, took in a healthy $32.6 million, buoyed by rave reviews. The almost wordless Paramount production stars actor/director John Krasinski and real-life wife Emily Blunt as a couple silently struggling to protect their family from invading aliens who are blind but can track their prey by sound. In third place over the Friday the 13th weekend was yet another horror film, new Universal/Blumhouse release “Truth or Dare,” which took in $19.1 million — more than five times the movie’s minuscule budget. The supernatural thriller stars Lucy Hale and Tyler Posey as spring breakers caught up in an innocent game that turns deadly. Steven Spielberg’s “Ready Player One” — a futuristic homage to films of the 1980s — took in an estimated $11.2 million to cling to fourth place in its third week out (its budget was a not-so-minuscule $175 million). The Warner Bros. film tells the story of a teenage gamer (Wade Watts) who finds himself inside an addictive virtual reality world. And in fifth was “Blockers,” a raunchy comedy from Universal starring John Cena and Leslie Mann, which netted $10.3 million.